Utilizing proprietary surface technologies, MabPurix resin is made of highly cross-linked 4% agarose beads with a particle size of 45-165 µm and a recombinant Protein A with the molecular weight of 46.7 kD. 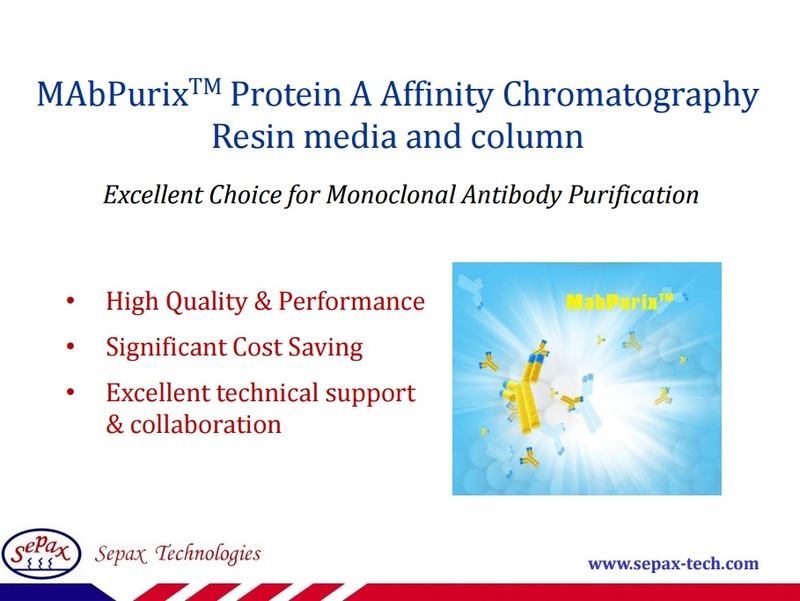 MabPurix Protein A affinity resin is designed to bind and elute monoclonal antibodies (Mabs) in affinity process chromatography for purification of recombinant proteins and Mabs. MabPurix is applicable at laboratory discovery, process development, clinical and commercial manufacturing scale for processes producing a few mgs to 10’s of kilograms of protein. This resin is an excellent purification tool in the manufacturing of both therapeutic and diagnostic proteins. Ligand Recombinant Protein A with the MW of 46.7 kD. IgG binding – E, D, A, B, and C regions. Long term storage: store at 2-8°C in a suitable bacteriostatic agent like 20% Ethanol or 0.02% Sodium Azide. Short term exposure to pH below 3 is sometimes required to elute strongly bound IgG species. However, care must be taken not to denature the protein ligand. MabPurix medium is shipped in 18.5&pm;1% ethanol at room temperature.